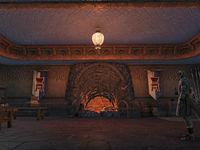 Vivec City Furnishing is a furnishings vendor located in Vivec City. It is located within the Saint Delyn Waistworks, in the eastern corridor. Formerly, the store's name as it appeared on the map was "Abbey Glassworks." This page was last modified on 20 March 2018, at 01:42.